Johann Carl Friedrich Gauss (/ɡaʊs/; German: Gauß [ˈkaɐ̯l ˈfʁiːdʁɪç ˈɡaʊs] ( listen); Latin: Carolus Fridericus Gauss; (30 April 1777 – 23 February 1855) was a German mathematician and physicist who made significant contributions to many fields in mathematics and sciences. Sometimes referred to as the Princeps mathematicorum (Latin for "the foremost of mathematicians") and "the greatest mathematician since antiquity", Gauss had an exceptional influence in many fields of mathematics and science, and is ranked among history's most influential mathematicians. Gauss was a child prodigy. 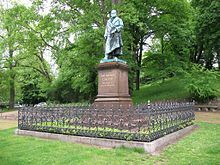 In his memorial on Gauss, Wolfgang Sartorius von Waltershausen says that when Gauss was barely three years old he corrected a math error his father made; and that when he was seven, he confidently solved an arithmetic series problem faster than anyone else in his class of 100 students. Many versions of this story have been retold since that time with various details regarding what the series was – the most frequent being the classical problem of adding all the integers from 1 to 100. There are many other anecdotes about his precocity while a toddler, and he made his first groundbreaking mathematical discoveries while still a teenager. He completed his magnum opus, Disquisitiones Arithmeticae, in 1798, at the age of 21—though it was not published until 1801. This work was fundamental in consolidating number theory as a discipline and has shaped the field to the present day. The year 1796 was productive for both Gauss and number theory. He discovered a construction of the heptadecagon on 30 March. He further advanced modular arithmetic, greatly simplifying manipulations in number theory. On 8 April he became the first to prove the quadratic reciprocity law. This remarkably general law allows mathematicians to determine the solvability of any quadratic equation in modular arithmetic. The prime number theorem, conjectured on 31 May, gives a good understanding of how the prime numbers are distributed among the integers. 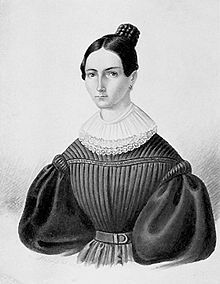 On 9 October 1805, Gauss married Johanna Osthoff (1780–1809), and had two sons and a daughter with her. Johanna died on 11 October 1809, and her most recent child, Louis, died the following year. Gauss plunged into a depression from which he never fully recovered. He then married Minna Waldeck (1788–1831) on 4 August 1810, and had three more children. 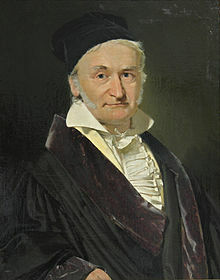 Gauss was never quite the same without his first wife, and he, just like his father, grew to dominate his children. Minna Waldeck died on 12 September 1831. One such method was the fast Fourier transform. While this method is traditionally attributed to a 1965 paper by J.W. Cooley and J.W. Tukey, Gauss developed it as a trigonometric interpolation method. His paper, Theoria Interpolationis Methodo Nova Tractata, was only published posthumously in Volume 3 of his collected works. This paper predates the first presentation by Joseph Fourier on the subject in 1807. In 1831, Gauss developed a fruitful collaboration with the physics professor Wilhelm Weber, leading to new knowledge in magnetism (including finding a representation for the unit of magnetism in terms of mass, charge, and time) and the discovery of Kirchhoff's circuit laws in electricity. It was during this time that he formulated his namesake law. They constructed the first electromechanical telegraph in 1833, which connected the observatory with the institute for physics in Göttingen. Gauss ordered a magnetic observatory to be built in the garden of the observatory, and with Weber founded the "Magnetischer Verein" (magnetic association), which supported measurements of Earth's magnetic field in many regions of the world. He developed a method of measuring the horizontal intensity of the magnetic field which was in use well into the second half of the 20th century, and worked out the mathematical theory for separating the inner and outer (magnetospheric) sources of Earth's magnetic field. Carl Friedrich Gauss, who also introduced the so-called Gaussian logarithms, sometimes gets confused with Friedrich Gustav Gauss [de] (1829–1915), a German geologist, who also published some well-known logarithm tables used up into the early 1980s. 1801: Disquisitiones Arithmeticae (Latin). A German translation by H. Maser Untersuchungen über höhere Arithmetik (Disquisitiones Arithmeticae & other papers on number theory) (Second edition). New York: Chelsea. 1965. ISBN 978-0-8284-0191-3. , pp. 1–453. English translation by Arthur A. Clarke Disquisitiones Arithmeticae (Second, corrected edition). New York: Springer. 1986. ISBN 978-0-387-96254-2. .
1809: Theoria Motus Corporum Coelestium in sectionibus conicis solem ambientium (Theorie der Bewegung der Himmelskörper, die die Sonne in Kegelschnitten umkreisen), Theory of the Motion of Heavenly Bodies Moving about the Sun in Conic Sections (English translation by C.H. Davis), reprinted 1963, Dover, New York. 1821, 1823 and 1826: Theoria combinationis observationum erroribus minimis obnoxiae. Drei Abhandlungen betreffend die Wahrscheinlichkeitsrechnung als Grundlage des Gauß'schen Fehlerfortpflanzungsgesetzes. (Three essays concerning the calculation of probabilities as the basis of the Gaussian law of error propagation) English translation by G.W. Stewart, 1987, Society for Industrial Mathematics. ^ Dudenredaktion; Kleiner, Stefan; Knöbl, Ralf (2015) [First published 1962]. Das Aussprachewörterbuch [The Pronunciation Dictionary] (in German) (7th ed.). Berlin: Dudenverlag. pp. 246, 381, 391. ISBN 978-3-411-04067-4. ^ Krech, Eva-Maria; Stock, Eberhard; Hirschfeld, Ursula; Anders, Lutz Christian (2009). Deutsches Aussprachewörterbuch [German Pronunciation Dictionary] (in German). Berlin: Walter de Gruyter. pp. 402, 520, 529. ISBN 978-3-11-018202-6. ^ "Gauss, Carl Friedrich". Encyclopedia.com. Retrieved 17 September 2018. ^ Zeidler, Eberhard (2004). Oxford Users' Guide to Mathematics. Oxford, UK: Oxford University Press. p. 1188. ISBN 978-0-19-850763-5. ^ a b c d Dunnington, G. Waldo. (May 1927). Dunnington, Waldo (1927). "The Sesquicentennial of the Birth of Gauss". Scientific Monthly. 24 (5): 402–414. JSTOR 7912. Archived from the original on 26 February 2008. CS1 maint: BOT: original-url status unknown (link) Also available at "The Sesquicentennial of the Birth of Gauss". Retrieved 23 February 2014. Comprehensive biographical article. ^ a b "Carl Friedrich Gauss". Wichita State University. ^ "Mind Over Mathematics: How Gauss Determined The Date of His Birth". american_almanac.tripod.com. ^ Susan Chamberless (11 March 2000). "Letter:WORTHINGTON, Helen to Carl F. Gauss – 26 July 1911". Susan D. Chambless. Retrieved 14 September 2011. ^ Waltershausen, Wolfgang Sartorius von (1856). Gauss zum Gedächtniss. p. 12 https://archive.org/details/bub_gb_h_Q5AAAAcAAJ. ^ a b c Bruno, Leonard C. (2003) . Math and mathematicians : the history of math discoveries around the world. Baker, Lawrence W. Detroit, Mich.: U X L. p. 178. ISBN 978-0-7876-3813-9. OCLC 41497065. ^ "Gauss, Carl Friedrich (1777–1855)." (2014). In The Hutchinson Dictionary of scientific biography. Abington, United Kingdom: Helicon. ^ a b Brian Hayes (14 November 2009). "Gauss's Day of Reckoning". American Scientist. 94 (3): 200. doi:10.1511/2006.3.200. Retrieved 30 October 2012. ^ a b c d Bruno, Leonard C. (2003) . Math and mathematicians : the history of math discoveries around the world. Baker, Lawrence W. Detroit, Mich.: U X L. p. 179. ISBN 978-0-7876-3813-9. OCLC 41497065. ^ Bruno, Leonard C. (2003) . Math and mathematicians : the history of math discoveries around the world. Baker, Lawrence W. Detroit, Mich.: U X L. pp. 178–9. ISBN 978-0-7876-3813-9. OCLC 41497065. ^ O'Connor, John J.; Robertson, Edmund F., "Carl Friedrich Gauss", MacTutor History of Mathematics archive, University of St Andrews . ^ Gauss stated without proof that this condition was also necessary, but never published his proof. A full proof of necessity was given by Pierre Wantzel. See the Constructible polygon article for further discussion. ^ Pappas, Theoni, Mathematical Snippets, 2008, p. 42. ^ a b c d e Bruno, Leonard C. (2003) . Math and mathematicians : the history of math discoveries around the world. Baker, Lawrence W. Detroit, Mich.: U X L. p. 181. ISBN 978-0-7876-3813-9. OCLC 41497065. ^ Bühler, Walter Kaufmann (1987). Gauss: a biographical study. Springer-Verlag. pp. 144–145. ISBN 978-0-387-10662-5. ^ Hecht, Eugene (1987). Optics. Addison Wesley. p. 134. ISBN 978-0-201-11609-0. ^ Bass, Michael; DeCusatis, Casimer; Enoch, Jay; Lakshminarayanan, Vasudevan (2009). Handbook of Optics. McGraw Hill Professional. p. 17.7. ISBN 978-0-07-149889-0. ^ Ostdiek, Vern J.; Bord, Donald J. (2007). Inquiry into Physics. Cengage Learning. p. 381. ISBN 978-0-495-11943-2. ^ "C.F. Gauss (1797–1855)". Royal Netherlands Academy of Arts and Sciences. Retrieved 19 July 2015. ^ Monastyrsky, Michael (1987). Riemann, Topology, and Physics. Birkhäuser. pp. 21–22. ISBN 978-0-8176-3262-5. ^ Bühler, Walter Kaufmann (1987). Gauss: a biographical study. Springer-Verlag. p. 154. ISBN 978-0-387-10662-5. ^ This reference from 1891 ( Donaldson, Henry H. (1891). "Anatomical Observations on the Brain and Several Sense-Organs of the Blind Deaf-Mute, Laura Dewey Bridgman". The American Journal of Psychology. 4 (2): 248–294. doi:10.2307/1411270. JSTOR 1411270. ) says: "Gauss, 1492 grm. 957 grm. 219588. sq. mm. "; i.e. the unit is square mm. In the later reference: Dunnington (1927), the unit is erroneously reported as square cm, which gives an unreasonably large area; the 1891 reference is more reliable. ^ Bardi, Jason (2008). The Fifth Postulate: How Unraveling A Two Thousand Year Old Mystery Unraveled the Universe. John Wiley & Sons, Inc. p. 189. ISBN 978-0-470-46736-7. ^ a b Bühler, Walter Kaufmann (1987). Gauss: a biographical study. Springer-Verlag. p. 153. ISBN 978-0-387-10662-5. ^ Gerhard Falk (1995). American Judaism in Transition: The Secularization of a Religious Community. University Press of America. p. 121. ISBN 978-0-7618-0016-3. 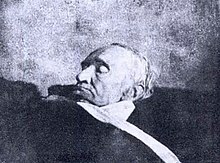 Gauss told his friend Rudolf Wagner, a professor of biology at Gottingen University, that he did not fully believe in the Bible but that he had meditated a great deal on the future of the human soul and speculated on the possibility of the soul being reincarnated on another planet. Evidently, Gauss was a Deist with a good deal of skepticism concerning religion but incorporating a great deal of philosophical interest in the Big Questions, that is. the immortality of the soul, the afterlife and the meaning of man's existence. ^ Bühler, Walter Kaufmann (1987). Gauss: a biographical study. Springer-Verlag. p. 152. ISBN 978-0-387-10662-5. Closely related to Gauss's political and social views were his religious beliefs. Despite his religious beliefs. Despite his strong roots in the Enlightenment, Gauss was not an atheist, rather a deist with very unorthodox convictions, unorthodox even if measured against the very liberal persuasions of the contemporary Protestant church. ^ Guy Waldo Dunnington (2004). Carl Friedrich Gauss: Titan of Science. MAA. p. 356. ISBN 978-0-88385-547-8. I must confess that such old theologians and song writers as Paul Gerhard have always made a great impression on me; a song by Paul Gerhard always exerted a wonderful power on me, much more than, for example, Moses, against whom as a man of God I have all sorts of qualms. ^ Guy Waldo Dunnington (2004). Carl Friedrich Gauss: Titan of Science. MAA. p. 305. ISBN 978-0-88385-547-8. " Two religious works which Gauss read frequently were Braubach's Seelenlehre (Giessen, 1843) and Siissmilch's Gottliche (Ordnung gerettet A756); he also devoted considerable time to the New Testament in the original Greek. ^ Guy Waldo Dunnington; Jeremy Gray; Fritz-Egbert Dohse (2004). Carl Friedrich Gauss: Titan of Science. MAA. p. 300. ISBN 978-0-88385-547-8. Gauss's religious consciousness was based on an insatiable thirst for truth and a deep feeling of justice extending to intellectual as well as material goods. He conceived spiritual life in the whole universe as a great system of law penetrated by eternal truth, and from this source, he gained the firm confidence that death does not end all. ^ Morris Kline (1982). Mathematics: The Loss of Certainty. Oxford University Press. p. 73. ISBN 978-0-19-503085-3. ^ "Gauss, Carl Friedrich". Complete Dictionary of Scientific Biography. 2008. Retrieved 29 July 2012. In seeming contradiction, his religious and philosophical views leaned toward those of his political opponents. He was an uncompromising believer in the priority of empiricism in science. He did not adhere to the views of Kant, Hegel and other idealist philosophers of the day. He was not a churchman and kept his religious views to himself. Moral rectitude and the advancement of scientific knowledge were his avowed principles. ^ a b c d e f g "Person:GAUSS, Carl Friedrich (1777–1855) – Gauss's Children". gausschildren.org. Retrieved 10 December 2017. ^ a b c d e f Bruno, Leonard C. (2003) . Math and mathematicians : the history of math discoveries around the world. Baker, Lawrence W. Detroit, Mich.: U X L. p. 180. ISBN 978-0-7876-3813-9. OCLC 41497065. ^ "Johanna Elizabeth Osthoff 1780–1809 – Ancestry". www.ancestry.com. Retrieved 10 December 2017. ^ a b "Letter: Charles Henry Gauss to Florian Cajori – 21 December 1898". Susan D. Chambless. 11 March 2000. Retrieved 14 September 2011. ^ Bell, E.T. (2009). "Ch. 14: The Prince of Mathematicians: Gauss". Men of Mathematics: The Lives and Achievements of the Great Mathematicians from Zeno to Poincaré. New York: Simon and Schuster. pp. 218–269. ISBN 978-0-671-46400-4. ^ Bessel never had a university education. ^ Dunnington, G. Waldo (2004). Carl Friedrich Gauss: Titan of Science. p. 416. ^ "Nt.number theory - Did Gauss know Dirichlet's class number formula in 1801?". ^ Klein, Felix; Hermann, Robert (1979). Development of mathematics in the 19th century. Math Sci Press. ISBN 978-0-915692-28-6. ^ Cooley, James W.; Tukey, John W. (1965). "An algorithm for the machine calculation of complex Fourier series". Math. Comput. 19 (90): 297–301. doi:10.2307/2003354. JSTOR 2003354. ^ Gauss, C.F. (1876) [n.d.]. Theoria Interpolationis Methodo Nova Tractata. 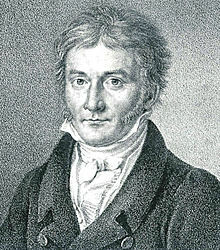 Carl Friedrich Gauss Werke (in Latin). Göttingen: Göttingen] K. Gesellschaft der Wissenschaften zu Göttingen. pp. 265–327. ^ Heideman, M.; Johnson, D.; Burrus, C. (1984). "Gauss and the history of the fast fourier transform" (PDF). IEEE ASSP Magazine. 1 (4): 14–21. doi:10.1109/MASSP.1984.1162257. ^ Felix Klein, Vorlesungen über die Entwicklung der Mathematik im 19. Jahrhundert. Berlin: Julius Springer Verlag, 1926. ^ Oscar Sheynin, History of Statistics, Berlin: NG Verlag Berlin, 2012, p. 81. ^ Stephen M. Stigler, "Gauss and the Invention of Least Squares," Ann. Statist., 9(3), 1981, pp. 465–474. ^ Steven G. Krantz (1 April 2010). An Episodic History of Mathematics: Mathematical Culture through Problem Solving. MAA. pp. 171–. ISBN 978-0-88385-766-3. Retrieved 9 February 2013. ^ Halsted, G.B. (1912). "Duncan M.Y. Sommerville". American Mathematical Monthly. 19 (1): 1–4. doi:10.2307/2973871. JSTOR 2973871. ^ Sondow, J. (2014). "From the Monthly Over 100 Years Ago…". American Mathematical Monthly. 121 (10): 963. arXiv:1405.4198. doi:10.4169/amer.math.monthly.121.10.963. jstor.org arXiv "Gauss and the eccentric Halsted". ^ The Prince of Mathematics. The Door to Science by keplersdiscovery.com. ^ "Book of Members, 1780–2010: Chapter G" (PDF). American Academy of Arts and Sciences. Retrieved 8 September 2016. ^ H.J.S Smith,Presidential Address, Proceedings of the London Math. Soc. VIII, 18. ^ Derbyshire, John (2003). Prime Obsession: Bernhard Riemann and the Greatest Unsolved Problem in Mathematics. Washington, DC: Joseph Henry Press. p. 202. ISBN 978-0-309-08549-6. ^ baharuka (25 October 2012). "Die Vermessung der Welt (2012) – Internet Movie Database". Internet Movie Database. ^ "Bayerisches Staatsministerium für Wissenschaft, Forschung und Kunst: Startseite" (PDF). Stmwfk.bayern.de. Archived from the original (PDF) on 25 March 2009. Retrieved 19 July 2009. ^ Władysław Kozaczuk, Enigma: How the German Machine Cipher Was Broken, and How It Was Read by the Allies in World War Two, Frederick, Maryland, University Publications of America, 1984, p. 7, note 6. ^ "Johann Carl Friedrich Gauß's 241st Birthday". www.google.com. Retrieved 30 April 2018. ^ Kühn, Klaus (2008). "C.F. Gauß und die Logarithmen" (PDF) (in German). Alling-Biburg, Germany. Archived (PDF) from the original on 14 July 2018. Retrieved 14 July 2018. Bühler, Walter Kaufmann (1987). Gauss: A Biographical Study. Springer-Verlag. ISBN 978-0-387-10662-5. Dunnington, G. Waldo. (2003). Carl Friedrich Gauss: Titan of Science. The Mathematical Association of America. ISBN 978-0-88385-547-8. OCLC 53933110. Gauss, Carl Friedrich (1965). Disquisitiones Arithmeticae. tr. Arthur A. Clarke. Yale University Press. ISBN 978-0-300-09473-2. Hall, Tord (1970). Carl Friedrich Gauss: A Biography. Cambridge, MA: MIT Press. ISBN 978-0-262-08040-8. OCLC 185662235. Kehlmann, Daniel (2005). Die Vermessung der Welt. Rowohlt. ISBN 978-3-498-03528-0. OCLC 144590801. Tent, Margaret (2006). The Prince of Mathematics: Carl Friedrich Gauss. A.K. Peters. ISBN 978-1-56881-455-1. Grimes, James. "5050 And a Gauss Trick". Numberphile. Brady Haran. Archived from the original on 11 April 2013.